PIN - SARAH COVENTRY. "HOLIDAY ICE" FROM 1969. 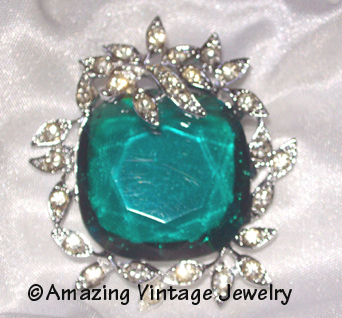 STUNNING, EXTRA-LARGE GREEN FACETED GLASS CENTER, SURROUNDED BY GLEAMING SILVERTONE AND CLEAR RHINESTONES. ABOUT 2 1/8" LONG, 1 7/8" ACROSS. VERY GOOD CONDITION. (CLEAR RHINESTONES LOOK YELLOWED IN THE PHOTO BUT MORE CLEAR IN PERSON).